At his first press conference as CEO of Apple, Tim Cook unveiled the iPhone 4S, the next generation of Apple's hit smartphone. Cook, who became Apple's chief executive following Steve Jobs's resignation in August, promised that the iPhone 4S would be far faster than its predecessor, offering speedier downloads thanks to its revamped antenna system and faster processing as a result of its new chip. The most notable new feature will be the iPhone 4's integration of a virtual, voice-activated personal assistant: Siri. Powered by technology developed by a company of the same name Apple acquired in 2010, Siri will answer questions a user poses by speaking to the phone, read text messages out loud, speak reminders, and more. The iPhone 4S will feature the high resolution Retina Display that was introduced on the iPhone 4 and an A5 processor (which currently powers Apple's iPad 2) that will make the phone twice as fast as the previous generation of the iPhone. Its battery has also been improved -- Cook noted that users can expect 8 hours of talk time, or an hour more than the iPhone 4 -- it will be a "world phone" compatible with both GSM and CDMA networks, and the phone has been equipped with a new wireless system that will enable it to "intelligently switch" between its two, built-in antennas so that it can send and receive data at the same speed as 4G phones, according to Cook. The iPhone 4S will have an upgraded 8 megapixel camera. In addition to offering higher-resolution photos with 60 percent more pixels than the iPhone 4, the iPhone 4S will allow for 1080p HD video recording and has been revamped to let users take better pictures in lower light and snap shots faster than on other phones. 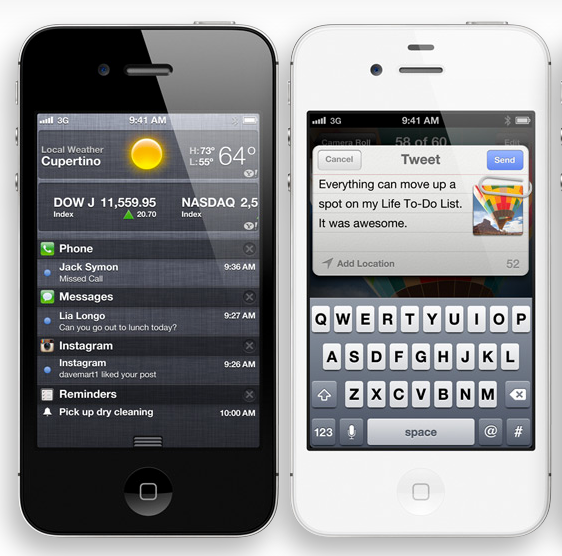 The iPhone 4S will be available for pre-order on October 7 and will hit stores October 14. Not only will be available on AT&T and Verizon, two wireless carriers that already offered the phone, but Sprint will also be offering the iPhone 4S. Battery life estimates: 8 hours talk time on 3G, 14 hours on 2G. 6 hours of browsing on 3G, 9 on Wi-Fi. 10 hours of video playback, 40 hours of music. Theoretical download speeds of 14.4Mbps (as opposed to 7.2 on the iPhone 4.) Interestingly, Schiller called out Motorola, LG, and HTC for calling these speeds “4G”. 8 megapixel camera (Photo resolution: 3264 x 2448). The camera also takes advantage of image processing on the A5 chip, enabling stuff like Face detection and 26% more accurate white balance. Voice-controlled personal assistant. You can ask things like “Will it rain in Cupertino?”, or “Can you find me a Greek Restaurant in Palo Alto?”, or “What’s the time in Paris?” and it’ll answer accordingly. This is the culmination of their purchase of Siri back in 2010 — and surprisingly enough, they’re keeping the “Siri” name. Pricing 16GB for $199, 32GB for $299, or 64GB for $399. This is the first time Apple has offered a 64GB iPhone.